Monsieur Cardin regarded his 'Cosmos outfits' as the style of the year. This outfit forms part of the Cecil Beaton Collection, brought together by the society photographer Sir Cecil Beaton (1904-1980). With great energy and determination, Beaton contacted the well-dressed elite of Europe and North America to help create this lasting monument to the art of dress. The Collection was exhibited in 1971, accompanied by a catalogue that detailed its enormous range. 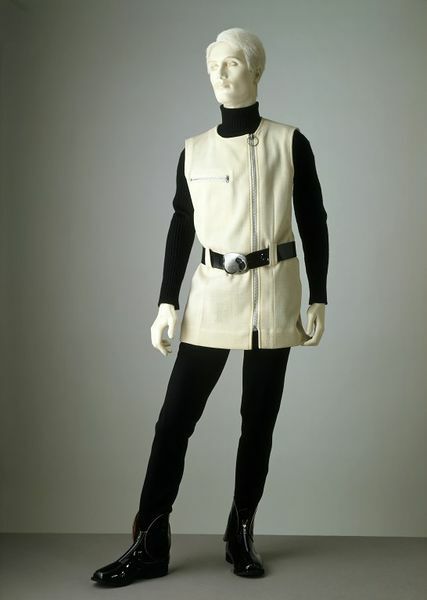 White wool jersey tunic, sleeveless, with metal zippers, worn over black ribbed poloneck sweater and black jersey ski trousers. Leather belt with lead buckle and black patent leather ankle boots with large circular pattern tops. 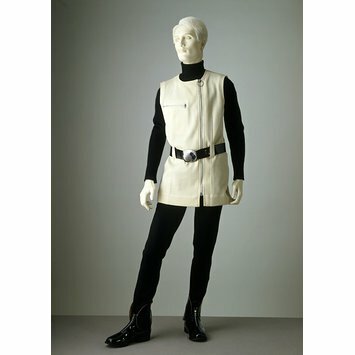 Man's ensemble of white wool jersey tunic, black wool jersey trousers, black wool roll neck sweater, black leather belt, black ankle boots; French, 1967.
a fashion feature and was quickly copied by many other manufacturers.